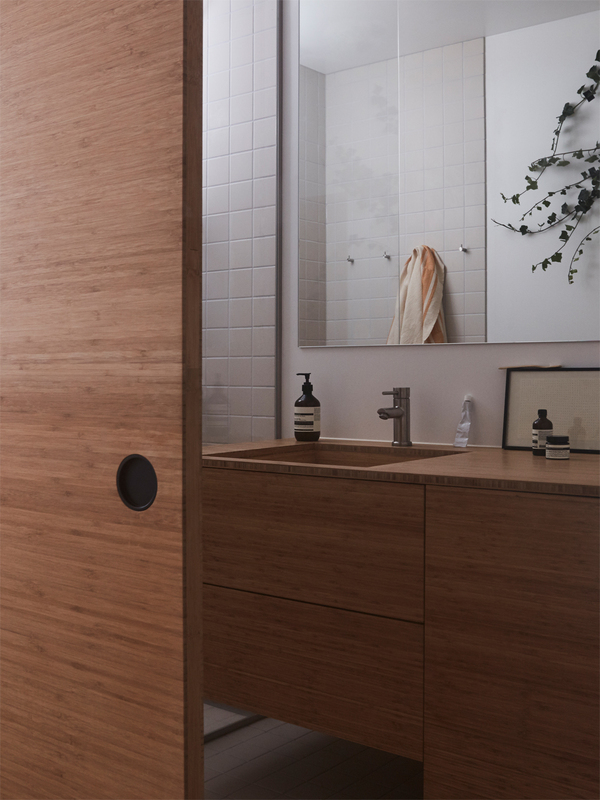 In this apartment at Torshov in Oslo, we designed and built a one of a kind – bathroom furniture. The owner is an architect himself and he redesigned the bathroom as a whole. He contacted us to help him build a custom made bathroom furniture, totally made out of bamboo. With custom joinery and bespoke solutions, we transformed the bathroom from its original state. Everything, including the basin, is made out of bamboo. The general palette is clean and materials such as minimal tiles, bamboo and large mirror gives the room contrasts, depth and an organic feel within the small space. Quality finishes and the custom made bamboo door contribute to making this bathroom something a bit out of the ordinary.